Rated as one of America’s top restaurants. Stellar service, amazing wine selections and chef/proprietor Sean Murphy is always cooking up something new. Located right on the beach with Gulf views. Check out the bar menu. Popular Gulf front Bradenton Beach restaurant..Fabulous sunsets and gorgeous views of the Gulf of Mexico… watch the dolphins frolic while having a margarita with the sand in your toes. Makes its home in a 1920’s cottage with nautical style interior on historic bridge street. The “Trap Yard” courtyard boasts a big covered deck and live music on the weekends. Florida casual rustic..located just 1/2 mile West of the Cortez bridge in the Cortez fishing village. Freshest seafood in the area. Enjoy the live music on the deck and watch the boats come in with your fresh fish dinner. “World famous burger and coldest beer in town” Family operated and local favorite for 40 years. Casual and fun. Don’t ask for French fries. Inspired local island fare, craft beers in a cozy casual atmosphere. Owned by Sean Murphy of Beach Bistro. Try the tempura beets or local catch. Fun casual restaurant on the beach serving breakfast, lunch and dinner. Tiki available for weddings and parties. Great views! Classic old Florida feeling located in the Historic Village of Longboat Key. Nestled against the shores of upper Sarasota Bay, it’s tranquil waterfront setting provides the perfect back drop for dining on fresh native seafood. Dine inside the quaint dining room or on the outside covered deck overlooking serene Sarasota Bay. Dock at the private 12 slip dock for a true Florida dining experience. Popular family owned Sushi house featuring traditional rolls and Japanese fare in relaxed atmosphere. Located at the North end of the island at Galati’s Marina. Take a look at the million dollar yachts in the marina. Quintessential “Old Florida”. Located at the North end of Anna Maria Island. 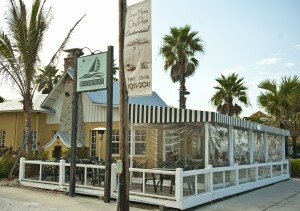 Order the best Grouper sandwich in the area or imbibe with a beer or wine and watch the dolphins and people fishing. Amazing views of the Gulf of Mexico and the Sunshine Skyway Bridge. The popular Sandbar is located on Anna Maria’s North end of the island. Fabulous and spectacular sunsets and gorgeous views of the Gulf of Mexico and famous wedding destination. Located on the North end of the Island where famous “Fast Eddies” used to be.. gorgeous water views of the Gulf of Mexico, Tampa Bay, Egmont Key and The City Pier. Excellent destination for exceptional cuisine, world class wines and unique Lagers and Ales. Weekly Wine tastings every Thursday night from 5-7 in the garden courtyard on the Bay.